I’m a pistachio ice cream lover, but I haven’t always been. As a kid I was a Mint Chocolate Chip (MCC) ice cream party hack. I subscribed to the theories that MCC had to have a vibrant green hue, was it the only green ice cream allowed, that pistachio was simply some sort of mutant flavored only eaten by weirdo adults and that I would never dare to taste pistachio ice cream because that would have been the ultimate slap in the face to MCC. 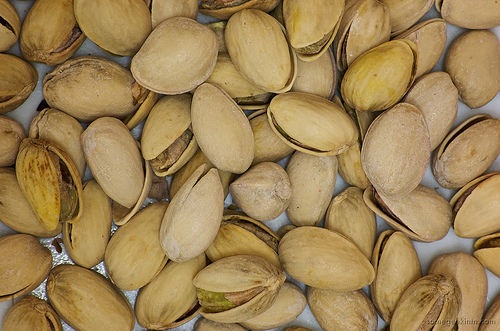 I also had no idea what a pistachio nut was, because what 7 year old has a distinguished enough palate to explore beyond peanuts–more likely peanut butter. As far as I was concerned almonds were pushing the nut frontier. However, now at the ripe age of 28, pistachio has become a regular to go at the ice cream parlor and lucky for me, it’s a regular offering at most establishments. According to the interwebz, the creation of pistachio ice cream is attributed to James W. Parkinson of Philadelphia, who was the son of George and Eleanor Parkinson, a couple that made Philadelphia ice cream famous in the nineteenth century. As a professionally trained chef, Mr. Parkinson was exposed to a widening variety of cooking techniques and international spices, from which he probably developed the idea to make a pistachio nut flavored ice cream. And what a fantastic idea it was. If you’ve tried pistachio nuts, then you’ll be very familiar with the smooth, distinct, nutty taste of pistachio ice cream. I find that ice cream’s decadent richness makes the nut’s flavoring distinctively smooth and subtle, allowing the flavor to develop slowly through your palate. The inclusion of toasted, slightly salty bits of pistachios makes for a variety of texture that is the perfect ice cream combination. Depending on where you decide to try pistachio ice cream, you’ll likely be met with differences in intensity of the pistachio flavorings. Commercial ice creams, sold in your grocers freezer, tend to have a more muted level of nuttiness, which can be a good place to start if you’re unsure you even like pistachios, but it can also be, I’m my opinion, very luck-luster and disappointing. As a pistachio ice cream lover, when I order pistachio ice cream I want the pistachio to come before the ice cream flavor. If you’re going to start here go for Haagen Daaz or Ben & Jerry’s. 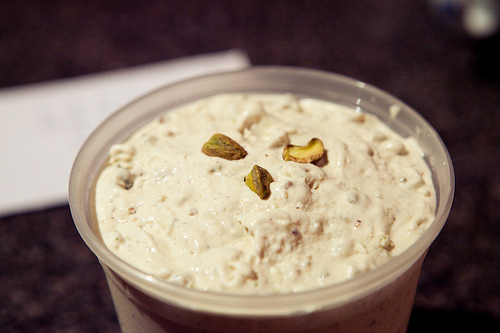 Solid pistachio ice creams can be found at many DC ice shops. Dolcezza offers a solid gelato version called Pistacchio Siciliano that definitely carries a pistachio punch. Giffords’ and Max’s Best Ice Cream Shop offerings follow a more traditional take, focusing on a creamy rather then nutty finish. I’ve never gone to Maggie Moo’s or Cold Stone Creamery, and ordered pistachio as the base ice cream, because as an ice cream purist and can’t really fathom messing up the deliciousness of the pistachio flavoring with Teddy Grahams, Gummy Bears or some other mix in. Personally for me, the best pistachio ice creams I’ve ever had were served as desserts at Indian restaurants, like Indique or Rasika. 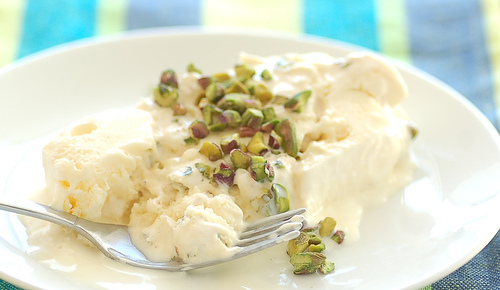 These ice creams are generally freshly made and the chefs are not afraid to let the level of pistachio intensity reach the true essence and flavoring of the pistachio nut. If you’re looking to pair pistachio ice cream with another one or two or three scoops, then try to keep the flavor combination to mild. I’d suggest going with vanilla, creme burlee, or perhaps some other nut variety like almond. Pistachio ice cream is definitely a flavor that if you haven’t already tried is definitely worth a taste. And who knows, it could become your go to flavor for the summer 2010. Pitango has a solid entry in the gelato category. If you’re traveling outside of the city, the Pistachio gelato at Pane e Vino’s deli in Lorton is pretty damn good as well. Is it odd I feel reassured that there are so many other Pistachio ice cream/gelato fans out there? I was asking around to see if anyone had tried Pitango’s pistachio. Must get over there and check it out. Not odd at all. Pistachio rules!